Light and comfortable, the Edelrid Shield Lite helmet uses an in-mold construction to shield your brain bucket from rockfall. The helmet is well ventilated with a minimal pack size, great for working hard in the mountains. The interior is ergonomically shaped with soft, removable padding, resulting in surprisingly comfortable protection. It doesn’t look too bad either. Airflow system keeps you cool with large tapered vents that work with pack attachments. Expanded polystyrene core and polycarbonate shell is the new standard in mountaineering. Adjustable head and chin straps lets you get the fit right with or without a beanie. Headlamp clips, EN 12492 certification, and extra padding (10g) complete the checklist of features. Materials Expanded polystyrene interior, polycarbonate shell. 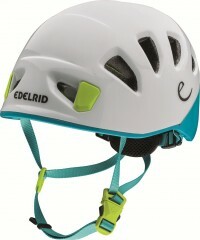 Bottom Line Quality lightweight mountaineering helmet.